Monday 11th March 2013 – 1.35pm – Chris Kowalik. 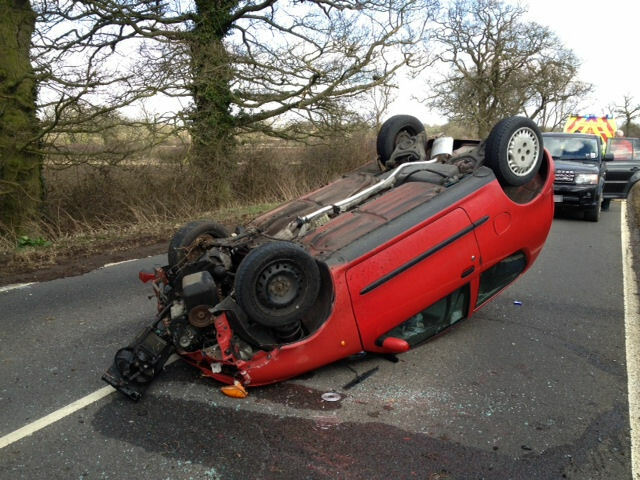 A woman and a baby boy have been taken to hospital after the car they were in ended up on its roof in Warwickshire. West Midlands Ambulance Service was called to Gaydon Road, near Brookside Farm, Bishops Itchington shortly before 11.45am today. A senior paramedic officer in a rapid response vehicle, an ambulance crew and the Warwickshire and Northamptonshire Air Ambulance attended. A West Midlands Ambulance Service spokesman said: “The woman driver who is in her twenties had neck, back and pelvic pain. She was immobilised with the use of a spinal board and neck collar. “The four month old baby was securely strapped to a child seat in the car and appeared to be uninjured.